Longtime Sisters High School Principal and football coach Bob Macauley has accepted a new job as principal of Glencoe High School in Hillsboro, Oregon. The Sisters School District made the announcement last Friday. Macauley told The Nugget that he and his wife Gail had been talking about the move this year. Two of their children live in Hillsboro and a daughter may be moving back into the area. "We're at peace with my decision," Macauley said, "though it's been a tough day on the heart strings today. My lifelong friends are here. "It's the right time for the Sisters School District," he said. "I report this information to you with mixed emotions," said Superintendent Jim Golden. 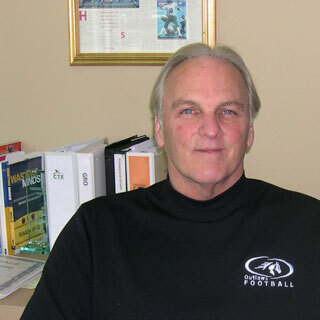 "Bob has worked for the Sisters School District for 19 years as an outstanding teacher, head football coach and administrator. Bob helped open the Sisters Middle/High School in 1992 and Bob and I were the administrators who opened the new Sisters High School in 2003. "However, this promotion will showcase Bob's talents in a large high school in the Portland Metro area and this new job will bring him a significant increase in salary and benefits. Finally, two of Bob's children live in the Portland area, which will bring him closer to family members." The high school is taking deep cuts as the district struggles to cope with a $1.2 million budget shortfall, which is coming after two previous rounds of budget cuts. Macauley acknowledged that dealing with the cuts is tough, but he does not feel that the high school was targeted and he is not leaving because of the cuts. "I think Jim was as strategic as you could possibly be with this catastrophic cut," he said. "We lost people that we didn't want to lose here. There are no good solutions in a $1.2-million cut after you've already gone through two cuts that were unprecedented in the state of Oregon." Macauley said he agrees with the premise that resources need to be focused at lower grades "if we're going to continue to function systemically at a high level." He did acknowledge that tensions with the school board dating back several years played a role in his decision to leave, but he declined to elaborate beyond saying: "It's just always better when you have the wind at your back and everybody is believing in each other." Macauley will probably be best remembered in Sisters in his role as a football coach, instilling values of teamwork and character into generations of players. He led the Outlaws to two state championships, in 1998 and 2000. He said his memories of Sisters center around such moments of achievement - sports championships, arts accolades. "Mainly I think back on lives who've touched me... and the joy of these kids," he said. He said he looks back fondly on working with then-superintendent Steve Swisher, SOAR director Tom Coffield and school board chair Bill Reed "to build a community around the schools." There were tough times, too, most notably a legal tangle with the state over a home school program administered by Macauley and involving a private Christian school that was eventually disallowed, requiring the district to pay back some $1.2 million in student funding to the Oregon Department of Education. Macauley seemed poised to finish out his career in Sisters. He says, " I wasn't planning on leaving Sisters. I've applied for one job in the last 19 years and it was Glencoe High School." He said he is looking forward to contributing his expertise and experience to a new team of educators in another high-quality school. Golden said that the details of a hiring process are still in the works, but there will be a selection committee. "I'm sure I will be able to get teachers in to be part of the selection committee," he said. "I've actually already been in contact with people I know across the state and will post (the position) hopefully (this) week," Golden noted. There is little likelihood of a homegrown Sisters candidate filling the principal's position. "I don't see anybody within our organization at this time ready to step up to that role," the superintendent said. As far as filling Macauley's big shoes as a football coach, Golden said the vagaries of attrition and cuts have put the district in the position of having to hire a couple of teachers at the high school even as other positions are being cut. That leaves open the possibility of hiring a teacher with coaching qualifications. "We'll try to attract a head coach/teacher and have a full-time principal," he said. He is confident that Sisters will be able to find a worthy successor to Macauley. "Sisters is still attractive and I think we'll get some good candidates," he said. For his part, Macauley hopes his successor takes the time to become a real part of the Sisters community. "There's really no shortcuts," he said. "This is a relationship community where spending time getting to know people and their hopes and dreams and talents is probably a really good investment of time." Looking back fondly over nearly two decades in Sisters and with excitement toward the next phase of his career, Macauley is satisfied, at peace. "I feel like the luckiest guy in the world," he said. "That's the truth."